Photograph courtesy A Forster. Its a damp June 2nd 1980 as 25172 arrives at Llandudno Jct assisting a failed diesel multiple unit. Its just after 1.00pm and the train in question is the 12.35 Llandudno - Manchester service. The sixteen year career of D7522/25172 included allocations at London Midland Region, Western Region, & Scottish Region depots. Time between last Classified repair and withdrawal: 51 months. Time between withdrawl and scrapping: 27 months. October 1965 to the Leicester Division (D15). September 1972 to Preston Division (D10). December 1972 to London Division (D01). December 1976 to Springs Branch (on loan and then made permanent the same month). 25172 was the 92nd Class 25 withdrawn, one of twelve retired during February 1981. After withdrawal 25172 was moved to Swindon Works on April 6th 1981 and was broken up by the first week of May 1983. Noted Glasgow Works October 1976 (Classified assumed). Noted Derby Works September 1978. Workings of Toton Class 25’s into March were nothing unusual, but their use by March crews for local trips during May took them on extended adventures, including 7522 to Cambridge on May 23rd. One of those ubiquitous but unpredictable Class 25 duties occurred on September 2nd when eleven wagons of the 02.18 Crewe - Watford freight derailed at Brinkley (between Nuneaton & Rugby). The train broke in two completely blocking all lines necessitating the use of the Saltley breakdown crane hauled by 7522, the lines not being reopened until after midnight. Condition November: two-tone green with full yellow ends. Despite being allocated to three regions and a considerable number depots, the recorded passenger haulage for 7522/25172 amounts to about a dozen trips. Half the trips worked were from the Midlands to Norwich/Yarmouth. On June 3rd 7522 & 5282 worked the 08.12 Derby - Norwich. 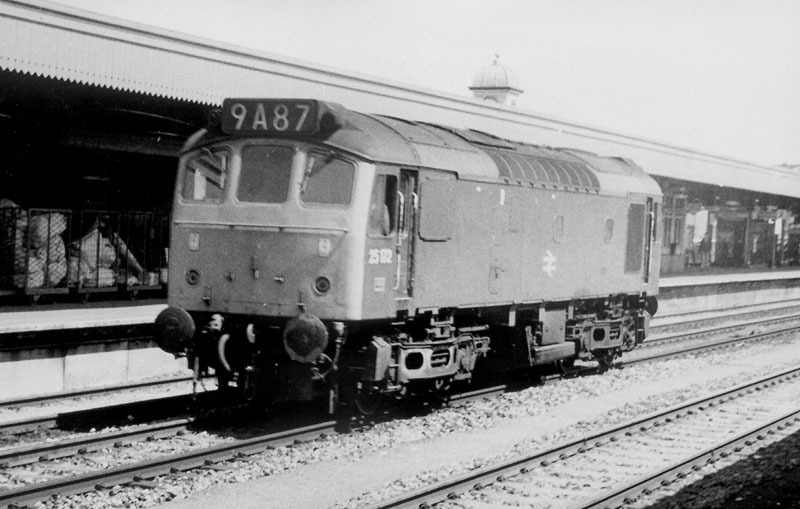 On June 24th 7522 & 7521 worked the Walsall - Norwich/Yarmouth - Derby diagram. A month later 7522 & 7619 were in charge of the 09.03 Birmingham New Street - Weymouth as far as Reading. On the late evening of May 25th 7522 was noted at Stonebridge Park. On June 1st a six coach afternoon Barrow - Manchester Victoria service was worked by 25172. Photograph collection of webmaster. 25172 at Cardiff, date unknown (but most likely between May 1974 & October 1976) - this Class 25 was allocated to Cardiff on two separate occasions, for a total of about ten months. A morning Nottingham - Lincoln parcels was worked by 25172 on June 24th. A Euston - Glasgow Central relief service was hauled between Crewe & Warrington (via Chester) on July 20th by 25172 & 25210. 25172 was noted southbound through Darlington with a parcels working. 25172 was noted on local duties from Tyne Yard on May 20th. On August 19th the Grange Junction - Shotwick gas pipe train was hauled by 25019 & 25172. 25172 was noted at Perth on October 24th in almost ex-works condition. On June 24th 25103 & 25172 were noted at Exeter stabling point. 25172 was noted eastbound through Blythe Bridge on July 17th with a short engineers train, including a crane. 25172 was stabled at Springs Branch depot on a snowy January 28th. On February 16th 25172 & 25285 were on snow plough duty on the Settle & Carlisle, there was definately plenty of snow this day. 25172 was stabled at Northwich depot on September 22nd. 25172 was noted passing through Guide Bridge with ICI bogie wagons on September 27th. 25172 was the Manchester Victoria pilot on March 19th & 20th. 25172 was noted heading east through Manchester Victoria during the afternoon of March 29th with coaching stock for Red Bank Sidings. 25172 was noted at Birkenhead Mollington Street on August 24th and at Reddish depot on August 26th. The 08.30 Rugby - Shrewsbury parcels was worked by 25172 on November 29th. The late morning Wellingborough - Acton freight was worked by 25150 & 25172 on December 23rd. 25172 was withdrawn on February 1st 1981. No.2 end headcode panel, standard two 'dots' but the background was white not black - July 1978 to March 1980?. Page added March 4th 2013. Last update April 20th 2019.